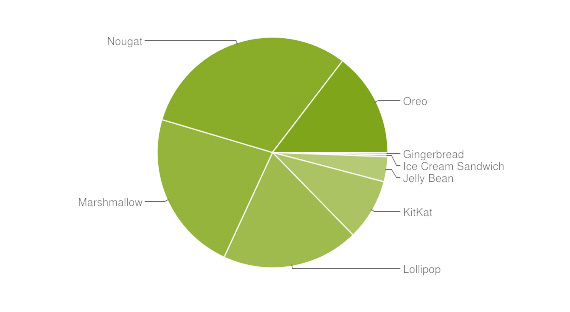 Android’s distribution numbers this September show no Android Pie. Oreo is now on 19.2% of devices; Nougat going strong with 29.3%. Google recently released its Android OS distribution numbers for the month of September 2018. Here are some key takeaways from the report. Oreo is now on 19.2% of devices. That’s a big leap from last July’s 12.1%. The issue here is that Android Pie is now out and Oreo is still not the majority. Surprisingly, Nougat is still the top Android OS with 29.3%, followed by Marshmallow with 21.6%. Gingerbread and Ice Cream Sandwich is hanging on as well, but it looks like the two won’t be there for long. Since its introduction, Android Pie is yet to appear on the chart, probably because it has not yet breached 0.1% distribution. Manufacturers really need to step up when it comes to Android Updates. The chart also shows how fragmented the Android OS is. But at least the majority of devices are on Lollipop and up. The data was collected from devices that visited the Google Play Store over a 7-day period ending on September 28, 2018.